The flute and the piccolo are both woodwind instruments that are used to create different kinds of music. Many solo and group performances feature these two instruments. While sharing some similarities, a flute and a piccolo differ in many ways. The flute is one of the oldest musical instruments known to man. The word flute describes a family of musical instruments that belong to the woodwinds category. The flute is a wind instrument that produces sound through air flowing across an opening, instead of a thin strip of material, which is called a “reed”. It is comprised of a tube (made of metal or silver for modern flutes) with holes, which are closed and opened by keys or fingers. Flutes are one the oldest musical instruments, with the earliest specimens dating back 35,000 to 43,000 years. Many experts hold that this suggests a developed musical tradition has been in place for a long time. Partially due to its long history, the flute is commonplace in many cultures. The Native American, Chinese, Indian and Japanese cultures all have their own versions of the flute. There are various kinds of flutes, such as transverse flutes and fipple flutes. A standard concert flute is in the key of C with a range of three octaves starting from middle C and going up. This makes the concert flute one of the highest-pitched concert and orchestra band instruments. 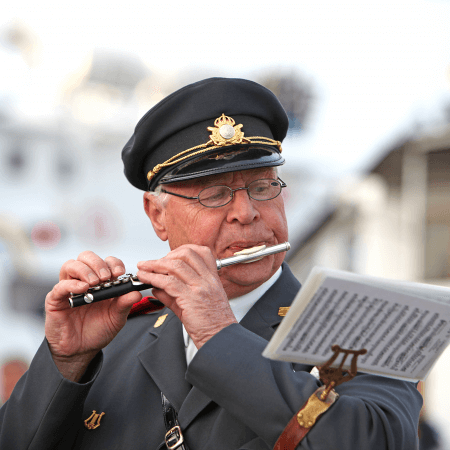 A man in uniform playing the piccolo. The piccolo is also a woodwind instrument and is half the size of a flute, and this smaller size causes it to sound an octave higher. The piccolo is the highest pitched instrument as the sound that it typically plays music an octave higher than the sheet music was written. It has a unique sound that is well suited for solo performances in symphonies or orchestras. It also features the same fingerings as the standard transverse flute. Some of the earliest uses of the piccolo were recorded in 1735, where a small transverse flute was used by opera orchestras in Paris. Piccolos were originally made of different kinds of glass, ivory, and wood. Nowadays, piccolos are usually made of resin, plastic, nickel, silver and some species of hardwood. Most modern piccolos resemble and share some similar features with the standard concert flute. So, what’s the difference between a flute and a piccolo? While a piccolo is a kind of flute, the two major differences between these two woodwind instruments are their sizes and the sound they produce. A contemporary concert flute would measure about 67 centimeters (26 inches) long, while a piccolo measures 32 centimeters (13 inches). Due to this difference in size, a piccolo sounds an octave higher. The sound a flute produces begins from middle C and goes three octaves higher, while the piccolo is made to play only in the key of C.
The flute’s versatile sound makes it a good instrument in jazz bands, orchestras and symphonies, while the piccolo’s high tone and distinct sound make it choice for solos in orchestras and symphonies. While the fingerings on both instruments are similar, a piccolo requires less air blown into it, although it requires more forceful blowing to produce higher notes. This makes learning to play the piccolo a bit harder than the flute. Beginners often choose to learn the flute, then move on to the piccolo. 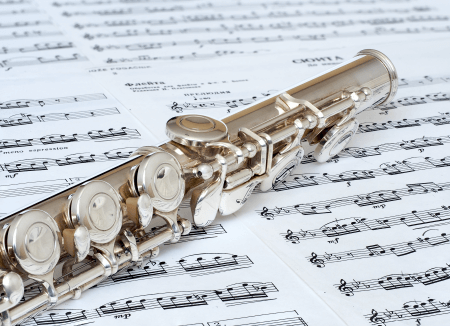 Modern flutes are often made of metal or silver, while piccolos are usually made of resin, plastic, nickel, silver and some species of hardwood.